Click the image to download a high resolution copy of the brochure. At this sacred time in our Church year, I want to extend to you and your family our most heartfelt prayers as we approach Holy Week and the Resurrection of Our Lord and Savior. St. John Neumann, who lived life with a focused commitment of ministering to those coming to America, presented hope to any and to all who were open to his message. People beginning life anew, building from within through the ministry of St. John Neumann, were touched by his desire to share his love of the Lord and his knowledge of the faith that he embodied. 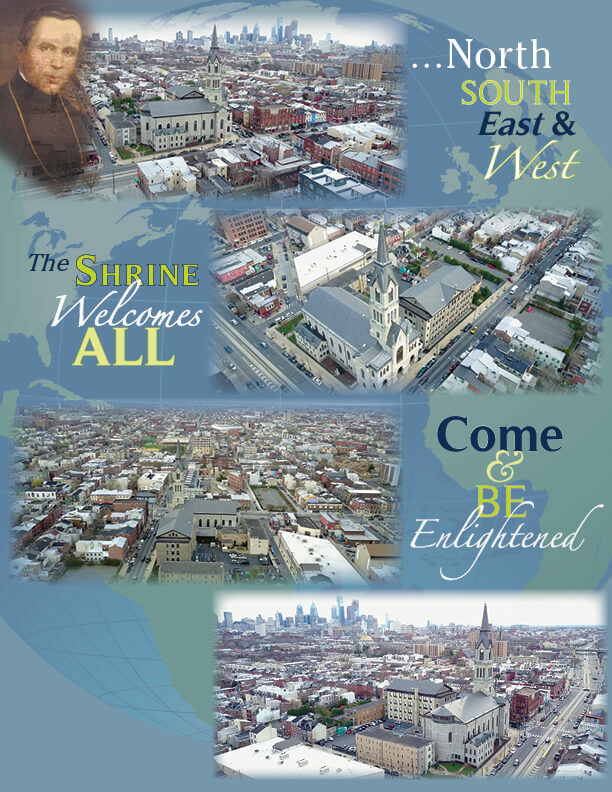 We at the Shrine invite all to start anew or to rekindle a past relationship with St. John Neumann by coming to the Shrine and benefitting from what we may offer you as a child of God. Continue your Lenten journey of prayer and sacrifice with us or rejoice in His coming by making a pilgrimage during the Easter season! Our priests are here to welcome you to bring God’s love and mercy to you through Confession, to share with you the Word and Eucharist, to lead you more deeply into the holy life of St. John Neumann. Simple though he was, our Saint always made time to pray for those in his care. We can learn much from his pursuit of humility which led him beyond himself to the service of others. Come and pray for those in your care! At the Shrine, we continue to offer prayers of thanks for all who are “Partnering With Us” in our expansion for Neumann Hall. The renovation is proceeding on time for an end-of-the-year opening. Please consider a donation for our efforts to enhance the Shrine experience, by creating space that expands the beauty and peace that the previous work provides. Learn more about our Capital Campaign. For more details about our campaign goals, download our brochure. To help us achieve our long-term goals, we invite you to make a pledge that will help continue the Shrine ministry for generations to come. Fill out this pledge card. We are grateful for your support. If you have any questions, please give us a call at 215.627.3080 ext.115.